Paramount Chief of Rewa , Roko Tui Dreketi Ro Teimumu Kepa during the opening of Rewa Provincial Council meeting at Burebasaqa Village on May 30, 2018. Photo: Ronald Kumar. The Gone Marama Bale Na Roko Tui Dreketi Ro Teimu­mu Kepa yesterday raised her concern on the collection of the Rewa provincial fees and educa­tion drop outs. She said that last year only $17,000 was collected representing only 19 per cent of the total amount and 71 per cent was paid by shares from Fi­jian Holdings Limited (FHL), Amal­gamated Telecom Holdings Limited (ATH) and Rewa Provincial Hold­ing Company Limited (RPHC). The money she said was for the Provincial Council Office to use. She said all districts in Rewa looked up to the office for their de­velopments and they should make sure that it had the funds for their projects. On education she said the school drop outs in the province should be given skills training. 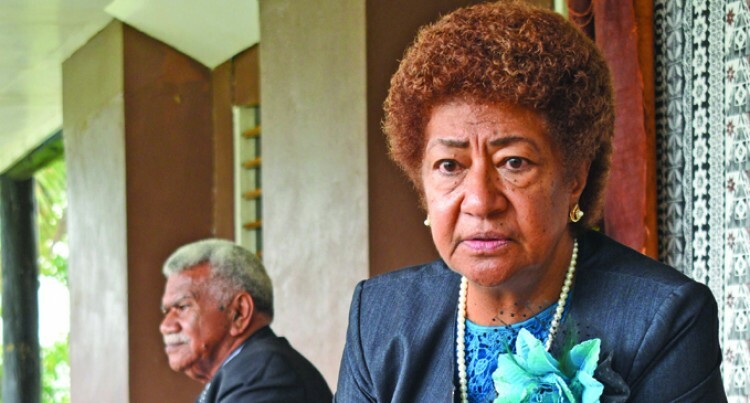 She said the Fiji National Uni­versity had been invited to make a presentation on its National Ap­prentice Scheme. This scheme is regulated and administered by the National Training and Productivity Centre through support from the indus­tries. Ro Teimumu said the school drop outs in the province should be trained with skills required by companies. “They cannot be trained with skills not relevant to companies,” she said during the Rewa Provin­cial Council meeting. Ro Teimumu reminded delegates that they should not rely on Gov­ernment funds for their develop­ment. “You should start your own pro­ject and ask for funds later,” she said. Ro Teimumu was accorded a full traditional welcome ceremony and was entertained by a lively spear dance from Suvalailai. The Rewa Provincial Council meeting at Burebasaga Village ends today.